Juan Cristóbal says: – In the last few months, the Chávez administration has gone into overdrive radicalism. Whether it’s the forced takeover of vast sectors of the economy, the harassment of private opposition media, the passage of draconian new legislation, the attacks on opposition politicians or the massive tax increases recently passed, there seems to be few aspects of public or private life that are safe from the government’s scorched-earth approach to governance. But has it hurt Chávez’s standing in public opinion? Yes, to a point. For the first time since the middle of last year, more people think things are going badly than well. This is a flip from the first quarter of 2009 of almost 20 points. And lest you think this is not important, remember that the 59-40 margin in the fourth quarter of 2006 roughly coincided with the 63-37 margin of Chávez’s election that year. 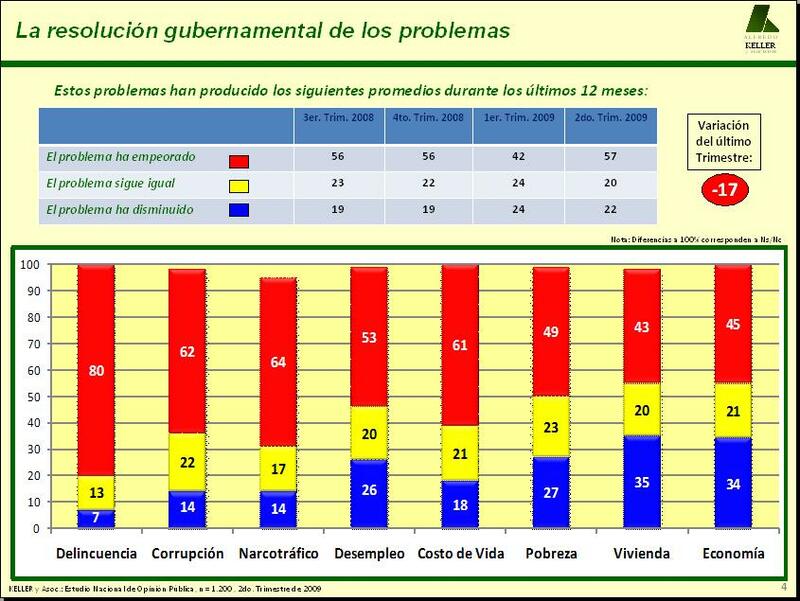 Also worth pointing out that in the fourth quarter of 2007, when the opposition won the Constitutional Referendum, a majority of Venezuelans thought things were going badly, but by the first quarter of 2009 when the government won, a majority thought things were going well. Is this margin reversible? Certainly. Nothing is set in stone. But the trend is there. Another interesting result came about when people were asked whether or not their problems had gotten better or worse. A large majority of Venezuelans think the country’s problems have either stayed the same or gotten worse in the last year. Crime is, of course, the main concern, and deteriorating safety conditions are clearly being felt by everyone. The government’s bright spots are “poverty”, “housing” and “the economy,” and even there the percentages of people that actually think things have gotten better are a paltry 27, 35 and34% respectively. Keep in mind those are the issues most vulnerable to the current economic downturn. One of the arguments being bandied about is that Chávez is much more popular than his government. There may be some truth to that. 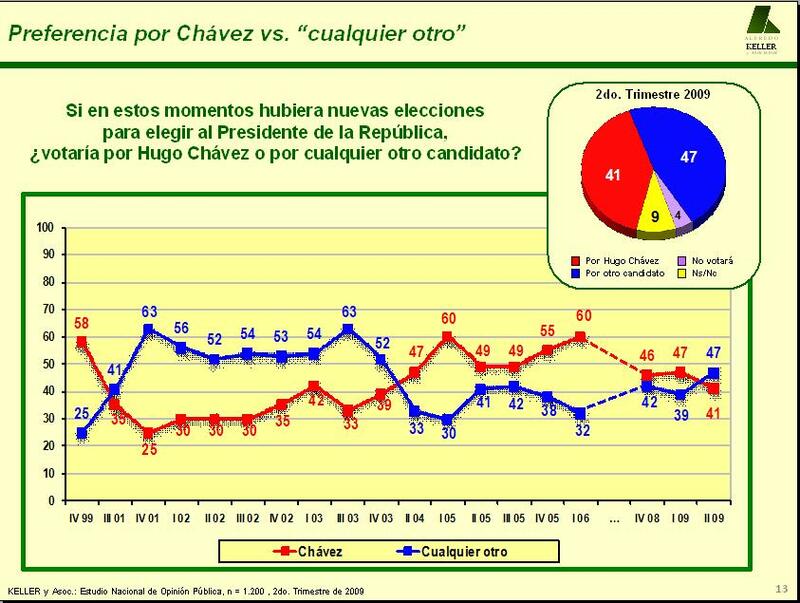 A slim majority of Venezuelans now think Chávez is becoming a dictator, as can be seen in this graph. Likewise, a less slim majority think Chávez is doing things the wrong way, mostly because they are starting to realize Chávez wants to mold Venezuela after Cuba’s communist system. The troubling thing about this is that a whopping 47% of Venezuelans don’t think Chávez is becoming a dictator, and 45% of them think he is doing things right, even though all the major problems in our society have gotten worse. Clearly, the teflon effect is still there, though not quite as strong as it used to be. 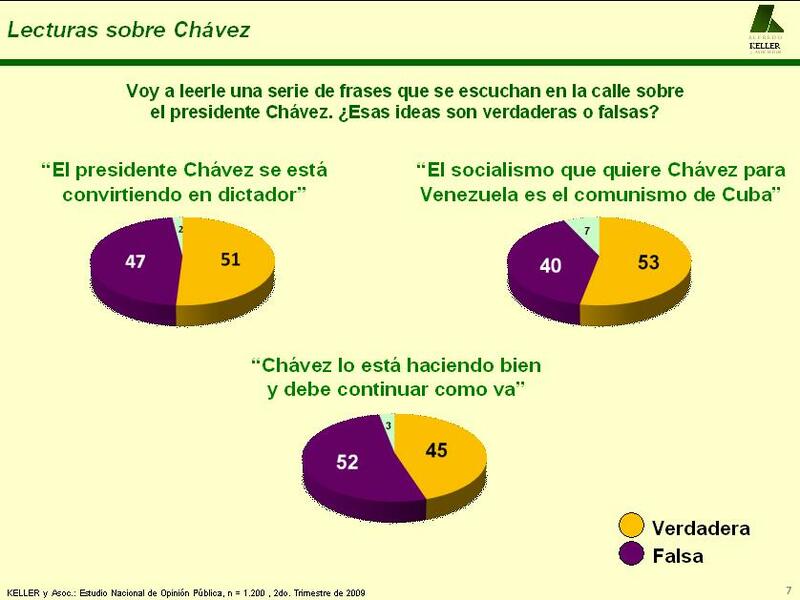 Finally, people were asked who they would vote for in a hypothetical election – for Chávez, or for someone else. This is always a tricky question. It’s one thing to say “the other guy/gal”, it’s quite another to actually go and vote for, say, Antonio Ledezma. 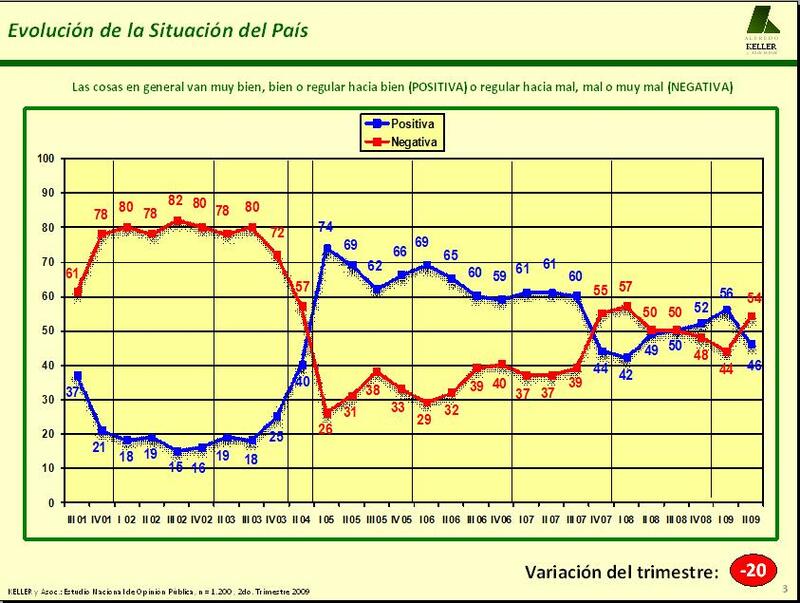 Nonetheless, there is something to be said about the fact that, for the first time since the IVth quarter of 2003 (six years, though the graph is abbreviated), a majority of Venezuelans would rather vote for a hypothetical other than for Chávez by a six-point margin. Clearly, the government’s radicalism has not gone unnoticed. The challenge (protracted sigh) is for our current opposition leadership to capitalize on this. Will they be able to? Will this even be a possibility? Who knows, but don’t keep your hopes up.